Govinda Willard took over as the part-time Catholic campus minister in the beginning of the spring semester, replacing Felicia Viscusi, who was the campus minister from September to December 2018. Viscusi left the university to be the full-time minister at Stony Brook, where Willard just left. The Campus Ministry is a part of the Diocese of Rockville Center, along with Adelphi, Hofstra, and Stony Brook universities. Father Michael Duffy is the current part-time chaplain of the ministry, which has been on campus for decades. He replaced the previous chaplain, Father Ted, in September 2017. During Viscusi’s brief time as campus minister, the ministry had daily meetings for prayer, fellowship, and reflection. There was rosary, a women’s group, and Bible study. “There were also opportunities to meet with college Catholics from different universities through various intercampus events. 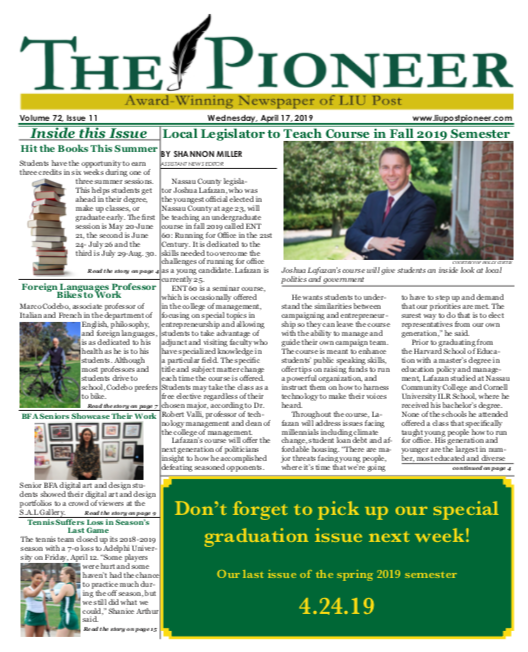 Service opportunities, a fall retreat, and an international mission trip to the Dominican Republic during winter break were all available to the students as well,” Viscusi said. Willard, who came from Stony Brook University, where she was campus minister and music director from September 2018 until this semester, said her role has three parts. First, she is “a support and a guide for students who are interested in exploring their faith or growing in their faith.” Second she will “cultivate a community within the university where students can meet and perhaps grow in friendship with other students who want to explore their faith, and grow in their relationship with God.” Third, she will “create events where students can come and explore their faith, like opportunities for prayer, or studying the Bible, or having women’s and men’s groups.” She will also plan service trips, social work, mission trips, and retreats. “My main goal is to create a Christ-centered community, a community of students that can find friendships and share values as well as to help students find the great joy and strength that comes from having a relationship with their Creator,” Willard said. While Father Duffy provides the sacramental needs for the ministry, Willard will run the other activities, but says there will be some overlap. Willard has great hopes that the Catholic ministry will be deeply powerful on the campus. “[T]he power of God is infinite,” Willard noted. “[W]hen the students and God show up, amazing things happen. I consider my role as evangelization through hospitality and friendship.” The Catholic campus ministry is larger than the student-run Newman Club, and it is through the ministry that the Mass and the sacraments are administered. Through prayer, mass attendance, and fasting, Willard started to feel the presence of God and of His existence. She wanted other people, particularly young people who are the age she was when she had her conversion, to be able to experience what is out there. 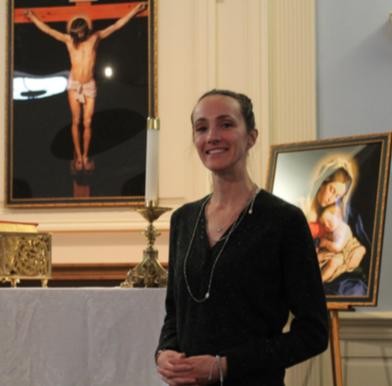 Willard volunteered in 2015 at Saint Anthony of Padua in East Northport as a catechist for eighth graders, allowing her to share her faith, provide counsel, and coordinate vacation Bible camps. The campus ministry has about 20 active students who attend Sunday masses. Jack Tomlinson, a first-year physical and health education student, views Willard as a blessing to the community. “She is an extremely nice and caring lady. You could tell that just by having one conversation with her,” Tomlin- son said. “As far as being a campus minister, so far she’s been extremely active.” Willard has planned several events for community service such as a trip to a soup kitchen and a day-long prayer retreat in Huntington. During a recent Sunday Mass, the musician was unable to be there, so Willard stepped in and played the guitar and sang. “It shows that she wants to be involved and not just be there,” Tomlinson said. Michaela Fox, a junior musical theater student, also has positive words to say about Willard. “She’s very sweet, and she’s ready to take on whatever is given to her. She has multiple talents; she’s musically talented, and very faithful, and devoted to the faith, and I think that’s exactly what we need in a campus minister,” Fox said. “You can tell [with] everything that she does, she does with God in her heart and in her mind, and that is what we need here on campus.” Fox sees Willard as someone who will bring a further emphasize missionary work to the campus ministry. “She’s very open-minded and she has a lot of plans,” Fox said.